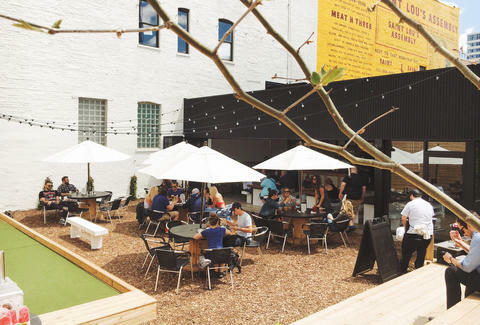 Whether it's on patios, rooftops, or the bleachers of their kids' Little League games, Chicagoans do not waste a single day of warm weather to drink outside. It's not just a leisurely activity -- it's basically an exercise in stockpiling enough fresh air and vitamin D to get us through the winter. Therefore, it's probably prudent that you check out this list of new outdoor-spaces where you can enjoy a cold one, or bucket of cold ones. The charmingly retro meat-and-three specializes in serving meals consisting of one protein and three sides (get it?). Honestly, the setup sounds like something your mustache-sporting dad would be into, and not the kind of establishment that has one of the hottest backyard patios in town. Who knows, maybe your pops would enjoy knocking back cold ones on the wood chip-filled patio equipped with string lights and a bocce ball court? So yeah, we're basically saying bring your dad and party. It seems like every few months a hot new rooftop opens, claiming its views are more breathtaking than squeezing into Donald Trump's corset. 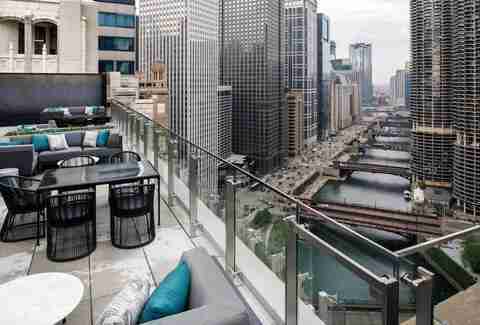 Well, start the slow clap, because the LH Rooftop may have the most-memorable view in the city, peering right down the middle of the concrete canyon that surrounds the Chicago River. Bring all your cash, because you won't want to leave. Some locals got their underpants in a wad when Marble closed down to re-concept, but then Best Intentions emerged like a majestic flamingo hatching from its cocoon. This updated take on a neighborhood dive offers a few wallet-friendly drinks and Big Buck Hunter, but the real draw is the backyard patio. Equipped with verdant palm plants and a cabana bar, it's one of the best summer-drinking spots in town. 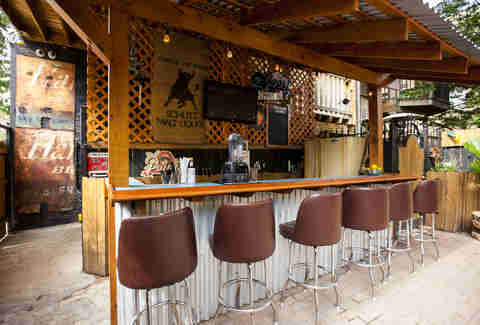 If you like whiskey, patios, and not being in danger of getting eaten by a shark, Whiskey Business is the place for you. Its sizeable rooftop patio, which it shares with the adjacent Cheesie's Pub, has room for 120 and overlooks bustling Milwaukee Ave. Also, it has zero sharks. That's a win-win. Taking over the space formerly occupied by Table Fifty-Two, Art Smith's Blue Door Kitchen & Garden is a stunning eatery. Awash in pastels and boasting marble-topped tables, the restaurant looks like it belongs in the French countryside. 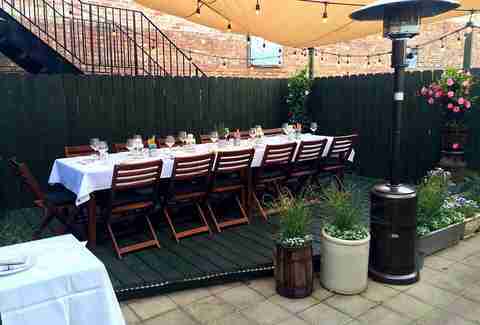 Luckily, diners can also enjoy farm-to-table fare and garden-to-glass cocktails in the charming backyard patio while stretching out in comfy wicker chairs. Federales is the Big Star of the West Loop, and we mean that as a compliment. 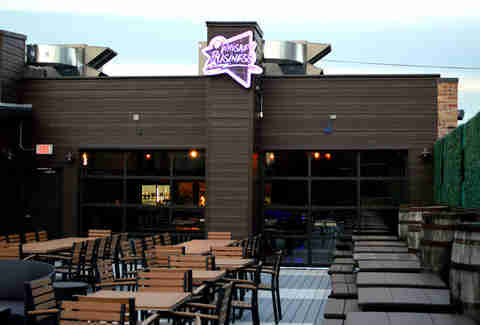 Tailor-made for summer hangouts, the outdoor patio buzzes with a crowd at seemingly all hours. 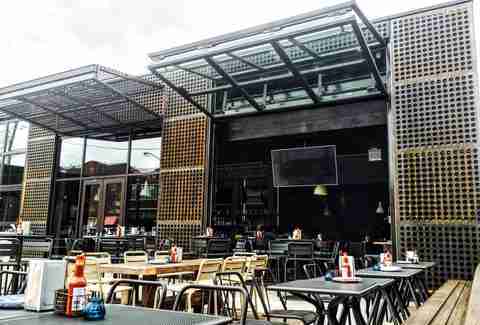 The indoor area also has a retractable roof, allowing Federales to open up like the Bears' run defense and patrons to catch some rays at the bar. Order up a few tacos and a tequila shot served in an ice glass, and repress all memories of winter forever. 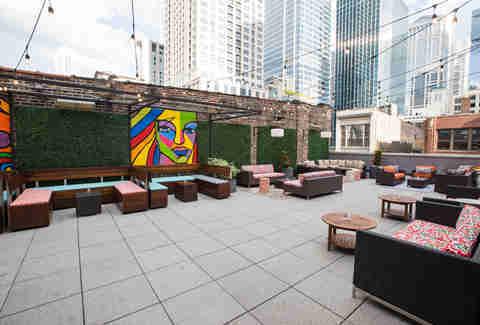 Located on the roof of this multi-level clubstaurant, the patio is a choice spot to grab after-work drinks. It's colorful and offers plenty of room to breathe, like an abandoned carnival. But unlike an abandoned carnival, there's a restaurant downstairs offering an eclectic menu that features everything from sushi to tacos. There's something here for everyone in your group. Heineken Pub 97 is located at The PrivateBank Fire Pitch, which is a 125,000sqft complex dedicated to year-round soccer. Inside, visitors will find plenty of 4K big screens and accessible pub grub. 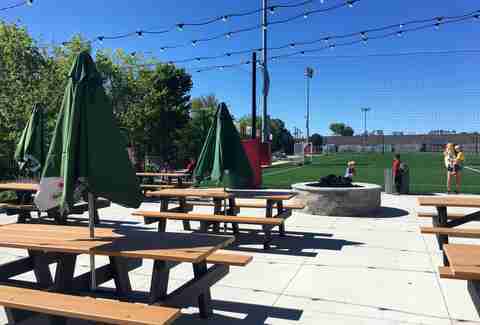 However, you should venture to the outdoor patio, which offers picnic tables, bags, a ping-pong table, and field-side seating from which you'll enjoy soccer games in *gasp* the actual real world. 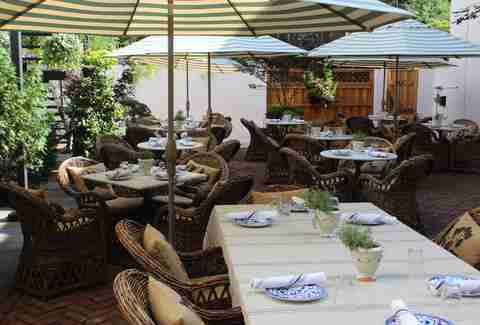 Admittedly, it'll take some planning to get to this reservation-only patio, which is appropriately named Giardino Segreto ("secret garden" in Italian). Yet, if you're planning a special dinner for you and 13 of your closest friends (or cocktail reception for up to 30), this is the spot. As a bonus, Chef Cameron Grant will prepare one of the finest Italian meals in town. That's a slam dunk.